"Good morning. It’s very good to be with you and to share in the time you have to reflect together on faith and education today. It’s a subject that’s been in the news rather more than usual over the last few months. All that has happened under the heading of ‘Trojan Horse’ has brought these issues to the fore in a way that has been painful for many. So this is a question that needs addressing carefully. To answer it we need to be clear what our schools are and what they do. Our schools are schools with a religious character – something that can be obscured by broad brush language of ‘faith schools’. I’ll talk about church schools and ‘faith-based’ schools as a shorthand today, but I’m conscious of how important the language is that we use. And all that has been made particularly clear – the dangers of the language – by the way that commentary around Trojan Horse has made it sound as if schools with a religious character are a problem. That’s simply not true and that fact seems to need a lot of repeating: no church schools or faith-based schools were caught up in Trojan Horse. We are the solution, not the problem. That needs saying really quite regularly. And let me say as we begin that I’m very glad to have this opportunity to celebrate the great gifts there are here in Birmingham. The whole city and region has been in the spotlight over this over the last few months and that has been very hard. One of the best initiatives in this city has been the ‘Birmingham Conversations’ Bishop David has begun, bringing a range of people together to explore some of the difficult questions about the place of lived faith in society. And thank you also to those who lead and work in and serve schools, for the work you do across the diocese – and I know there are one or two people here from other dioceses here as well. Thank you, because church schools shape their pupils and their communities, and shape us all for the future, and without you to lead them as chairs of governors, as head-teachers, as people working in education departments of dioceses, or as teachers, that simply wouldn’t be possible. And I want talk to you about reconciliation in action in the context of education and some of what that means for faith and education today. It’s a subject that I’m really very passionate about, because reconciliation has to be at the heart of our life as a church if we are going to be faithful to God, because the gospel of Jesus Christ is reconciliation – that’s what is absolutely at its heart. And schools, the most visible expression of the church’s mission in this country, need to be living that out. And I want to explain what I mean by reconciliation, because in popular use what it usually means is everyone agrees with everyone, or everyone pretends they agree with everyone. And both of those are rubbish. Reconciliation means finding ways for people to disagree well. It means finding ways for people who disagree well to go forward together without reducing their beliefs to a lowest common denominator or pretending that their difference does not exist. It’s honest, loving, faithful, committed disagreement. One practical example of church schools leading in reconciliation is around the issue of tackling homophobic bullying in schools, which has been a big thing for the National Society over the last year. Earlier this year I was excited to launch work by the Church of England’s education division that brought together good practice from church schools. We didn’t try to pretend that the different views Christians have about sexuality would disappear or that they didn’t matter; but the material helped us bring people together in their differences and work together to try to begin the process of stamping out homophobic bullying in our schools. That is work that the government has now picked up and is seeking to do across all schools and I think that just goes to show that church schools are already at the forefront, on the cutting edge, of making reconciliation work in schools. Church schools have a calling. They are great schools that offer a broad, well-rounded education. Across England 73 percent of our secondary schools and 82 percent of our primary schools are rated ‘good’ or ‘outstanding’. That’s a higher proportion in both cases than for non-church schools. And we are doing that in many of the poorest parts of the country. In many dioceses our church schools are in areas of great deprivation. That was certainly true in Durham Diocese when I was Bishop there. Looking forward that is an important priority and I know that Nigel [Genders] and [Bishop] Stephen Conway are both deeply committed to that, as are the bishops generally. Basically, you are doing the job, you are doing it well, and you are doing it where you are most needed. Church schools also have a distinctive identity and ethos that values the emotional, the spiritual and the social development of children as highly as their academic development. Holding together those two perspectives on the purpose of our schools is at the heart of the Church of England’s work in education. The thing about having a calling is that it broadens out your sense of why you exist – of what you’re for. Education as a calling is different from education as a function. And turning education into functionalism is one of the biggest dangers we face. More than 200 years ago the National Society began providing, systematically, schooling for children across England and Wales. It was a response to a deeply felt moral obligation to provide education for all, a gift of grace overflowing from the grace and love of Christ lavished in the church then and now. It was especially for the poorest and most vulnerable. 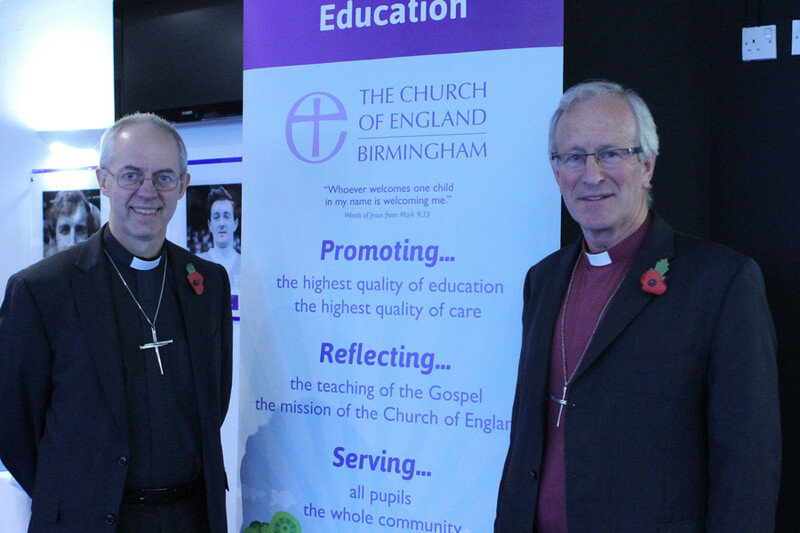 The Church of England’s service in education is a form of service to others. It is practical love in action. And when we think about our calling as a church, or as a school, or as an individual responding to Christ, we always have to look at the bigger picture. You can’t just tick one narrow set of boxes and think you’re done. God can see through that kind of thing quite easily. God sees a reality that is bigger and more hopeful than we normally imagine. That means that if you want to go where Jesus calls you, you need to be honest about who you are and you need see the reality of the world in which you’re living, whether you’re working as an individual or as an institution like a school, or, in fact, like the whole National Society. I think that might be one way we could sum up the challenges for reconciliation today, and also the reason why faith and education should walk hand in hand in bringing reconciliation in to our communities. Being true about who you are and being true about the reality of the people and places around you is much harder than sticking to the myths that are created about why to think we are, relying on easy descriptions that skate the surface­ of what really matters. You need to know who your neighbour is if you’re going to love them as Jesus said Christians must, and generally speaking as they do. You need to know what shapes their lives if you’re going to see how you can walk together. We also need to know and live out of the truth of our own tradition, our own faith, if we want others to trust us and work with us to build mutual flourishing and a shared peace. This is what church schools and indeed faith-based schools are called to and have the power to do. The Christian identity and ethos of our schools is the jumping off point for their contribution to community cohesion. This is particularly true, perhaps, in places of great diversity, where building cohesion is going to take serious efforts at reconciliation. I am not saying it’s easy, I’m not saying it’s already happening everywhere (although I know it is happening with great effect in many places, including here). But I am saying it must be done and we must not only be part of it but be leaders in it. And I rather suspect that most of you already are. Being passionate about our own faith is something that shapes church and faith-based schools across religious traditions in this country today. We share our experience of trust and commitment with those who lead schools in other Christian denominations and in other faiths. If we are to step forward together as leaders in reconciliation, we need to give thanks for that passion and to set alongside it – this is where it really cuts in – an equally passionate hospitality. We need to welcome those who live by another faith – or no faith – as partners with whom we will build our communities. Hospitality isn’t about making someone welcome once and knowing that makes it their turn next time. True hospitality is generosity that is resourced in God’s own generosity and it makes welcome and relationship possible across boundaries of faith or race or background, or even boundaries of ingratitude and hostility. That generous welcome is the authentically Christian way of life and we see it in our schools every single day as a point of complete routine in the hospitality that is shown to children and their families, to staff and to the wider community. When you welcome others you have a chance to see the reality of the world you live in more clearly. You meet a real person, not just a labeled thing like ‘a Christian’, ‘a Muslim’, ‘a Jew’, ‘an atheist’. Questions about school uniform or the kind of food you serve at school dinners are about people, not policies, when you stand face to face with someone who is both like and unlike you. If you are a Christian you understand that you are face to face with someone who is made in the image of God and loved by Jesus Christ enough to die for them. There is a reality in that encounter that goes beyond labels. That reality, that encounter, has potential. It has the potential to bring hope to communities around the country that we know are struggling not only with the relationships within their communities, but with the pace at which those relationships can change. In a ‘super-diverse’ city like Birmingham you will know this better than most. The degree of religious diversity here is both enormous and rapidly changing, and that presents huge challenges that aren’t always appreciated by people outside that context. Real hospitality, real welcome, give us a way to make room for proper transparency between our faiths and within our communities. Transparency that allows us to say, ‘this is what matters most to me’, ‘this is what my faith asks of me’, or even to say, ‘this is what I don’t understand about you.’ Real engagement. Real hospitality is also rooted in integrity that knows our faith has deep roots, that it isn’t up for grabs, but that it is always ready for generous challenge and enquiry. Transparency and integrity. Hospitality and welcome. Honesty and reality. These are the bricks and the mortar out of which we build a new story of religious difference. A story of peace that makes a difference. Perhaps even a peace that can only be built by telling the story of that difference together. Schools are places that build stories. Schools help build the stories of children’s lives, their questions, their growth in understanding. Church schools are, as you know far better than I do, well used to helping build those stories with children of many faiths, often with a vast majority of other faith or no faith in the school. Church schools are stores of experience and wisdom. They know what it is that makes them Christian, and they have practical expertise in using the foundation of their Christian faith to help children and young people learn about other faiths. Which means that those children in their turn can understand one another better, and be better neighbours. That is why good religious education is so important in all schools, because it builds understanding and that in turn helps build cohesion. Across this country we desperately need to understand one another better and we cannot do that without the contribution there is to be made by excellent RE. Trying to pretend religion doesn’t matter has a very different – and damaging – effect. There are positive signs that the Government is beginning to recognise this by increasing the number of training places for specialist RE teachers and committing to launch new criteria for Religious Studies qualifications at GCSE and A-level without delay. We want to see that commitment translated into urgent action and we need Government to recognise the fundamental importance of equipping our young people with real religious literacy that will enable them to navigate the world we are living in. Back to our context. Religious illiteracy struggles to cope with the blandishments of extremism, lives lived in a compelling narrative of spiritual reality have the best antibodies to that virus. Building a story of peace in religious difference isn’t an easy task, but it is essential. The difference we make may be the difference between friendship and hatred. Perhaps even the difference between peace and violence. What you are doing is of world changing importance. We live in a world that is struggling to negotiate changing patterns of religious identity. We know too well how religion is misrepresented and abused in this country and around the world as an instrument of division and sometimes even as a weapon of war. Yet we also know – and we give thanks for them – we know of hugely courageous religious leaders across faiths who are pointing out this abuse of religion for what it is. If we are going to build a peace in our communities that is equal to the challenges of today’s world, we need a vision of reconciliation that is honest about difference and equal to the challenge. We don’t deny the existence of difference. Neither should we paint difference as insurmountable when the reality is that we haven’t yet all found a way over that challenge. When we live in our differences in ways that bring us together and reflect the richness of our society, we make a transformative contribution to the conversation about British values in our schools. It’s a sensitive subject at the moment. It needs an injection of religious literacy. The welcome that is at the heart of the ethos of church schools is essential, not a good bit of added value. Our welcoming ethos is key to developing a practical understanding of what mutual respect and tolerance of those of different faiths and beliefs means in our daily lives. Across communities we have much in common, but there are real and important differences between our faiths. Sometimes our pursuit of unity has led us to play down our religious differences. Yet to move forward together we need to recognise them and know that they need not be a barrier between us. The values we describe together need to be vibrant and creative. I said at the beginning that church schools have a calling. I think this challenge – to tell the story of peace in situations of religious difference – is something God is calling our schools to now. I think he is calling our schools to be constant in faith and generous in welcome, to help children, or enable children, build the stories of their own lives and to understand the stories of their neighbours. To build bridges to families and communities and to be a partner as those families and communities build bridges with one another. That is why we need good church schools, and good faith-based schools, and good community schools. Schools of integrity, transparency and welcome. Schools of understanding and respect. Schools with a calling to help build a new story of peace and mutual flourishing in difference. I’d understand it if you felt, as I’ve said already, you had enough on your plates already, anyone would. But I also know that in a city of over 180 nationalities, where people belong to every branch of every religion, you know quite how much this matters. You are leaders of church schools. And church schools have a calling from Christ."